Summary : Loop ride to Lane Cove River National Park using Gore Hill and Epping Road cycle paths and relatively quiet back streets. Enjoy the tranquillity of the bush and river. Suitability Suitable for women riders comfortable in some traffic and a few hills. Features Encouraging womens cycling participation. 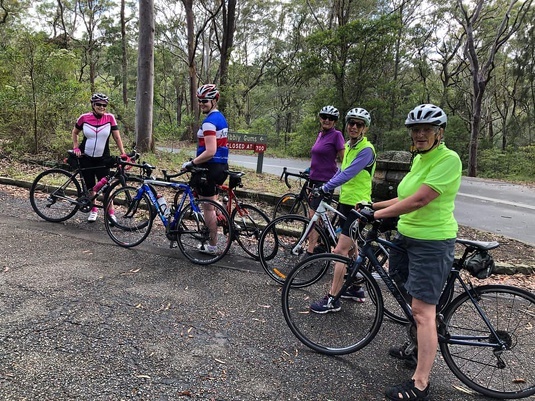 Scenic loop ride, Gore Hill and Epping Road cycle paths, relatively quiet back streets, smooth park road, river and bush views in Lane Cove River National Park. Scenic loop ride to Lane Cove River National Park via the Gore Hill cycle path and quieter streets of Naremburn, Artarmon and Chatswood. In the Park we ride close to the meandering river from the weir to the ticket booth near De Burgh's Bridge enjoying the tranquillity, river and bush views. Returning part way down to the Scribbly Gum exit we leave the park linking back to the Epping Road cycle path through the Riverside Corporate Park. We use mostly quieter back streets but do need to cross some busier arterial roads. Climbs are moderate or relatively short.